BY ANY MEASURE, it has been a bleak decade for Ireland’s famous pubs industry. An estimated 2,000 venues have closed, many falling victim to absurd costs as the country went through its collective Celtic Tiger-era property madness. But according to the co-founder of the Galway Bay Brewery, one of the few pub success stories to emerge from the recession, venue owners also need to shoulder their share of the blame for the industry’s near-terminal decline. “Before 2007, rents were extortionate, you had to turn over so much money to make a pub worth it,” Niall Walsh told TheJournal.ie. 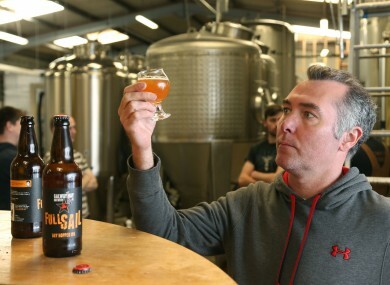 Just over 10 years after launching their first venture together, Walsh and business partner Jason O’Connell own nine bars and a thriving craft brewery under the Galway Bay banner, as well as a new beer-importation company. And all without a pint of Guinness to be seen. However their first idea was anything but a resounding success. The pair, who both had backgrounds in the hospitality trade, started off in 2004 with a few thousand euro in their own money and plans for a string of up to 30 gourmet pizza delivery outlets under their Pizza Eile brand. The idea never made it past the first rented kitchen space in Galway as it became clear consumers weren’t ready to pay a premium for flavours like aromatic duck and banana with blue cheese. The pair switched tack to serving gourmet burgers and the business took off, later relocating to a larger venue – the cavernous The Oslo in Salthill, Galway – where they also set up a beer menu stocked with craft brews. It was there that the Galway Bay Brewery was born in 2009, although with very modest ambitions. “Really, it wasn’t an intentional business move, it was more an idea for the pub. We had a big hall down the back and we wanted to brew our own beer on a small scale. By that stage the financial crisis had hit and the Irish economy had shifted into reverse. That meant money was very tight, but also that there were opportunities to be had with landlords suddenly willing to offer very favourable terms. But Walsh said the pair refused to cut corners in the kitchen, buying the best products and staying clear of frozen goods. As long as the food, the service and the beer was good – and all available at a reasonable price – the punters didn’t care if the venues were a bit scruffy, it seemed. And there was the ace in the hole, their own rapidly-expanding craft brew offering – which they only made available on-tap in the Galway Bay Brewery-branded pubs. Since their first brewery was started in the pub hall, it has been through a series of moves, the latest to what will be its long-term home in the Ballybrit industrial estate outside Galway. Three years ago the company also took on a new head brewer in Monaghan native Chris Treanor. “We’re producing world-class beers now, as opposed to three years ago when they were just OK,” Walsh said. Last year the Galway Bay Brewery produced 3,500 hectolitres of beer, an output expected to grow about two-thirds this year. But even that will be insignificant compared to the up to 40,000 hectolitres the pair are planning to produce from a new brewery on-site, for which they will need to raise €1 million of funding. To put that production in context, the total output from all Ireland’s microbreweries was estimated at 86,000 hectolitres last year. The pair will also open a tenth venue in Dublin’s Grand Canal Docks next year to add to their portfolio of pubs in both Galway and the capital. They have been scouting locations for new pubs from Northern Ireland to Cork and Limerick, as well as other areas. The brewery has expanded into export markets and bottled beer sales with plans to spread from its current sales footprint across the British Isles to mainland Europe over the next 12 months. Last year the various arms of their business took in over €12 million and Walsh said he expected the figure for the brewery, at least, to increase another 50% this year. But in case anyone would think the pair were blessed with the midas touch when it came to the drinks trade, there have been a few missteps along the way. Their pub empire was recently scaled back by one with the closure of the slow-trading The Scholars Rest in Galway, one of several businesses the pair has wound up over the past decade. There was also a wake-up call last July when JD Wetherspoon opened its first pub in the Republic, The Three Tun Tavern, pouring sub-€3 pints a few hundred metres from the duo’s The Dark Horse in Blackrock, south Dublin. But Walsh said the Galway Bay Brewery venue had now come back “close to where it was” and that its customers were happy to pay for quality. I don’t want to be critical of (JD Wetherspoon), they are what they are, but their offering is pretty basic. I know every end of production and you can’t produce a good pint of beer for €3. Despite Irish craft beer going through a boom about two decades ago that later fizzled out, Walsh said he couldn’t see anything derailing the burgeoning industry which now boasted an estimated 63 microbreweries of various sizes. “The market is very different today. Young people are very well-travelled, they’re used to going places like the US and Australia and getting great craft beer. Email “How two men built a pub and brewing empire from the depths of the recession”. Feedback on “How two men built a pub and brewing empire from the depths of the recession”.